Colifagina PRO is the fruit of the most advanced research on the biotechnology field. It is made up of alive and genetically typified probiotic strains (patent n. DSM16604 and DSM21981) capable of performing, in a synergetic way, the strengthening of the immune defence as well as doing a direct action against the pathogens proliferation, breaking down the intestinal charge of bacteria (potentially infectious also for the genito-urinary tract). The synergy of the two patented probiotic strains, Bifidobacterium Breve BR03 and Lactobacillus Rhamnosus LR06, favours the immune response against the intestinal pathogens, that are responsible for diarrhoea, meteorism, cystitis and vulvovaginitis. 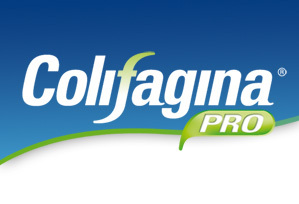 Colifagina PRO is enriched with Fructooligosaccharides (FOS), a probiotic fibre useful as a nutritive substratum for the Bifidobacterium and Lactobacillum proliferation. Colifagina PRO is gastro-protected thanks to the innovative and patented (Patent n. IBS2011/0050000) technical of micro-encapsulation. The micro-encapsulated structure grants the strains contained in Colifagina PRO, to get through the gastric barrier, and reach the bowel alive and lively, where they have to act. The new and exclusive patented coating technique of the lyophilized (contained in the container cap) preserves the vitality of the Colifagina PRO strains, providing a protection barrier against the humidity of the vial, that is the main degradation cause of the "drinkable" probiotics, before their consumption. In fact, all the drinkable probiotics (except the spores) are prone to this early death, due to the humidity transfer from the liquid to the container cap. 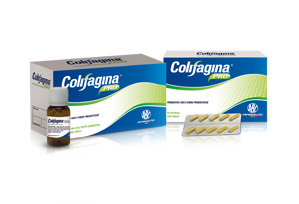 Colifagina PRO is available in handy monodose oral vials and capsules.